The start of June means that it is officially winter – a time when many of us groan and wish that we could go into hibernation until it stops being cold and grey outside. But winter can be an awesome season if you give it just a little bit of love, and where better to start than with your back garden, balcony or kitchen windowsill? In terms of gardening winter is a bit slow, but it isn’t dead! There are plenty of plants that do really well in the colder months, and if you’ve got a sunny windowsill there are even more possibilities. Here are our top seven winter plants to keep your fingers green, your tummy full and get you a much needed boost of fresh air and sunshine. Lots of beans and peas can be planted throughout winter including peas and snow peas. Pea plants grow flowers and after that will come the delicious pea pods (about 10 weeks or slightly longer for snow peas). Pick the pods regularly (every day if possible) and munch away! Garlic can be planted throughout winter (although the best time is June or August – July is sometimes a just bit too cold) and it’s so easy! Each clove will (hopefully!) sprout and send out green stalks, called scapes. You can eat one or two scapes per plant if you like while you’re waiting for the garlic to be ready. When the scapes go dry and start looking a bit dead, dig up the plants and each clove will have produced a full head of garlic. Some great herbs to plant over winter are dill, mint, rosemary and thyme. Plant dill in full sun (poor soil is okay! ), the seeds should be very shallow in the soil and don’t need to be covered over or patted down. Keep dill well-watered and when the shoots are about 5cm tall pick out the stragglers so each plant is about 20 cm apart. The best way to grow mint is from a cutting. Place the sprig in a glass of water and wait a couple of weeks until it has grown some good roots. Then, transfer it into soil (usually in a pot so that it doesn’t overtake your whole garden) and plant about 5cm deep. Give mint plenty of sunshine and keep the soil damp. When you are harvesting mint, take sprigs from the top, leaving some leaves lower down the stem – this will prompt it to grow nice and bushy. Rosemary is also best grown from a cutting. Take one (or more) sprigs that are about 10cm long and plant straight into soil. Give the plant plenty of indirect sunlight and keep it inside (if possible) for the first three weeks while the roots are growing. Water the cutting regularly for the first few weeks and infrequently after that – too much water makes rosemary sad. Thyme is best grown from seedlings, because from seeds it takes a long time. 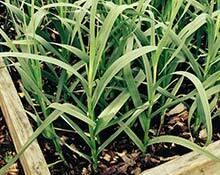 Plant the seedlings about 20 cm apart in well-drained soil and direct sun. If you’re not so into the veggies and want some pretty flowers to look at, plant things that grow from bulbs like daffodils or tulips and when spring comes around you can be the envy of all your neighbours! The images used are all in the public domain.